KAZAN, the Russian Federation (BulgarianMilitary.com) – Test pilots of the Mil Rotorcraft Factory of Russian Helicopters Group, which is part of the state-run corporation Rostec, conducted the debut flight of Russia’s new military transport helicopter Mi-38T. It was performed under the program of preliminary trials, reports a correspondent from the scene, cited by TASS, learn BulgarianMilitary.com. In front of the journalists, Russian Helicopters CEO Andrei Boginsky presented the current transport helicopter as the version which was manufactured by the joint work of the Kazan Rotorcraft Factory, the Mil Design Bureau and the Group, under a technical assignment approved by the Russian Ministry of Defence. Mi-38T is based on the civil helicopter Mi-38, and its production has been organized at the Kazan Helicopter Factory. Andrei Boginsky stressed the fact that the helicopter has all the basic certificates of Rosaviatsiya, and defined it both as a continuation and a possibility for new market. All Mi-38T systems and equipment will be checked whether they meet the requirements, set in the technical assignment of the Russian Defence Ministry, during joint special flight trials. Due to the fact that the new military transport helicopter is based on Mi-38 certified civil helicopter, it has been re-equipped in order to deal with transportation and troop landing tasks. The Mi-38T can be equipped with additional fuel tanks to extend the flight range and features the capability of reconfiguration in an ambulance helicopter. So far, the Russian Defence Ministry has signed a contract for the delivery of two Mi-38Ts scheduled to begin in 2019. And as the Russian Helicopters CEO Andrei Boginsky stated the work for promoting the new helicopter on foreign markets is underway. 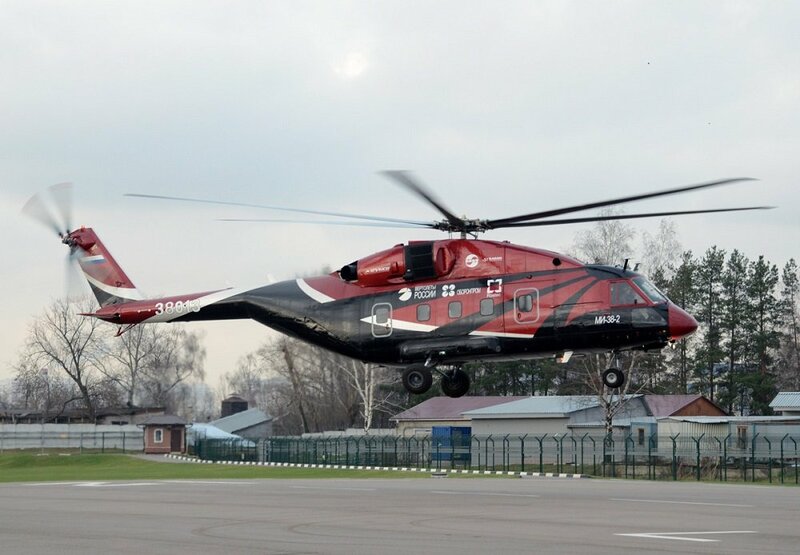 According to Vadim Ligai, the Deputy Managing Director of the Kazan Rotorcraft Factory the Mi-38T can accommodate up to 40 passengers on its board. He also revealed that the rotorcraft, which is made of 99% made domestic components, is equipped with TV7-117V highly efficient engines, production of the Klimov United Engine-Making Corporation. Mi-38T features capabilities such as an integrated digital pilot navigation system which data shows on five liquid crystal displays, an explosion-proof protected fuel system and additional landing gear struts which enable the helicopter to land on soft ground and snow.